All kinds of crafts have a long legacy of classic techniques that had meaning to the peoples they originated with. In crochet and knitting Aran stitches are great examples of this. Although most are originally knit stitches, some are crochet as well and have been passed down for many generations. This particular stitch is made of panels of 17 plus three. One panel is perfect for a scarf, a thick headband (or earwarmer) or a smaller sized washcloth. If you wanted a wider project you could either whipstitch appropriately length-ed panels of the 17 plus 3 together, like a quilt. Bobble: (yo, insert hook into fpdc)3 times, yo and through all 7 loops on hook, ch 1 to close bobble. Repeat Rows 2 and 3 until desired length is reached. Have a question about the stitch? Have a comment? Share with us here at Crochet Spot! This entry was posted on Tuesday, January 4th, 2011 at 12:35 PM by Erin Burger	and is filed under Tutorials and Help. You can follow any responses to this entry through the RSS 2.0 feed. You can leave a response, or trackback from your own site. What does bpdc and fpdc stand for? That´s a good one! Thanks! 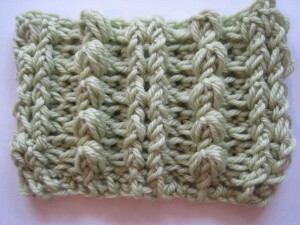 This is so cute , nice stitch for a scarf o a simple square for an afghan.Thanks for sharing. Same question – what are bpdc and fpdc? After working up this piece, I found that a modification to this tute is in order. Good eye, thanks so much. I can’t believe I missed that. Of course there is a bpdc instead of a fpdc next to the bobble. Fabulous pattern. I have been crocheting for almost 25 years and rarely see anything new. But I have never seen this stitch. Looking forward to trying it out! Thanks !!!!! Oh, My, I don’t know your abbreviations. this pattern is absolutely stunning in the picture! however, i’m not getting as many bobbles as you in 17 stitches . . . and it’s probably me mis-reading the directions. chain 2 & 2 fp = 3 stitches. 2 bp, bobble 2 bp, 2 fp = 7 stitches. so – i’m coming out with 2 bobbles instead of your 5 that’s in the picture with the 17 stitches. any assistance you could provide would be greatly appreciated as this is a last minute xmas gift for my daughter. of course, this probably affects row 2, which i didn’t detail. Hi Diane, it looks like there are 2 bobbles in the picture, just like what you are getting. Might look like 5 because of the post stitches that are on the ends and between the bobbles. thank you so much for your prompt reply! i guess i’ll have to try it again ’cause i want mine to look like yours! I REALLY wanted to do this sample….but I found it IMPOSSIBLE to do 2 fpdc in the 2nd & 3rd CHAIN from the hook at the beg of rows! You have to have a “stitch” to wrap around [that’s looped to the next stitch] in order to do a fpdc [or bpdc]. And….the sequence of sts don’t align correctly for the next row (as another commenter stated.) How do YOU do 2 fpdc’s around CHAIN STS? I think Erin is referring to the second and third double crochet stitches, not the chain stitches. So you would skip the first stitch and work into the second and third stitch. Doesn’t someone proof read & double check the wording, & do a sample using the pattern notes? Very frustrating to understand when it’s written incorrectly. I’ll try it again. [I take ptn notes very seriously & do exactly as it says….so trying to do the fpdc & bpdc in the 2nd & 3rd “chain” of the turn was impossible & very confusing. Someone needs to correct that error b4 it confuses all who try to make it.